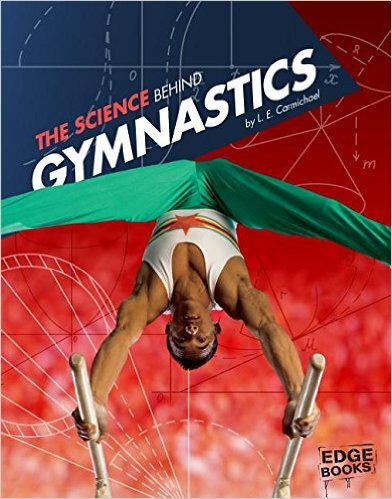 Out just in time for Rio 2016, The Science Behind Gymnastics is part of the Science of the Summer Olympics series from Capstone. It covers the biology of training and the physics of popular gymnastics events like trampoline, rhythmic gymnastics, and vaulting. It’s also got cool stories about record-breaking Olympic gymnasts from around the world. For grades 3-4, buy it for the junior gymnast in your life! I never took physics in university or high school, so this book was one of the hardest I’ve ever written – I had to teach myself the science before I could explain it. I was surprised to discover that gymnasts can perform twists and flips and spins, but scientists have a really hard time explaining how. The physics of twists is particularly poorly understood, but scientists think gymnasts use the same kind of process a falling cat uses to land on its feet. I spent a lot of my research time staring in awe at videos of Olympic gymnasts doing their thing. So amazing! "...packs a weighty spread of topics in its relatively few pages. Physics is a natural choice, but Carmichael also includes nutrition, engineering, and psychology. Each spread features splashy layouts with lots of photos and diagrams, and the text does a great job of introducing vocabulary, both in inset boxes on the pages where terms appear and in a comprehensive glossary. . . .plenty here to introduce a wide range of topics to students whose interest in gymnastics or this year’s Olympic Games might make for a tidy segue into school projects." "Photos abound in this STEM-ready Summer Olympics series. Critical thinking questions at the end of each volume give them that one-two Common Core punch. The many textual asides on the photo-laden pages include ample information for burgeoning athletes who really want to know how physics plays into sports. . . .A recommended first purchase for libraries looking to engage sports lovers in STEM topics."